Ah… a camcorder disguised as a clock. That’s the sort of thing I like to hear about of a Thursday morning. With a 4gb memory as well as a cunning disguise, this spy camera is perfect for those secret camera exclusives, embarrassing clips of your friends caught unaware… or whatever other reasons you have for secretly filming someone. Simply place the camera/clock on a desk or mantelpiece, switch it on underneath and let it unobtrusively film what’s going on. Of course, it would have to be your own room, you couldn’t just casually bring a clock to your friend’s house, or the pub, and leave it sitting around without raising suspicions or having to explain why you brought a clock. 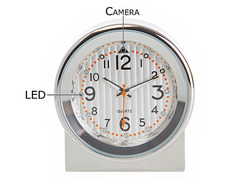 But given a situation where you can have the SPY Camcorder Clock sitting in a good position, it would work nicely. It has a pinhole lens, captures sound and colour video at 640 x 480 pixel and can store up to 5 hours worth of a video in an AVI format. The battery is rechargeable.